I guess you are reading this, because you have an intrinsic interest for the ocean, so maybe you’ll find this bit of of information useful. It will not repeat the word intrinsic, I just think it sounds great, and always wanted to use it somewhere. Just one more time: intrinsic. Very intriguing. 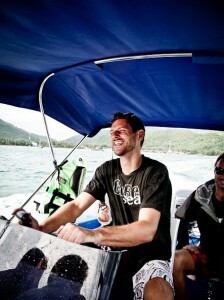 Boats are just plain awesome, and very scary at the same time. They are also aggravatingly annoying, should you be unlucky enough to own one. If you read this in America, Australia or New Zealand, you know how important the invention was, you’d probably still be in Europe or in Africa without them. Should you be a bit of a traveler, take a look at the different designs and solutions which are around, there’s a stunning variety, and some of them are just plain beautiful. Most of them have one thing in common, they make you nauseous, in rough weather. But there’s good news for landlubbers, try a hydrofoil, they are ridiculously stable. You might want to wear a lifejacket though, if they go wrong, they go wrong for good. There is one thing all designs have in common: they don’t have brakes. If you would like to park your boat, maybe for a spot of lunch, you’ll need to tie it up somewhere. Like with everything, there is different styles of doing that, in Europe you might use boxed moorings, in OZ and NZ you might even have a lovely little boathouse, where you can tinker about, and crack a few cold ones with your mates. Which has the added benefit that few people can hear you scream at your partially clogged high pressure pump array, which makes you engine stutter and cough, instead of purr. The most common method to park a boat is an Anchor, and that’s what this article is about. I don’t know when Anchors were invented, but the actual system is so simple, that I would guess it’s been around since the Homo erectus, if not longer. You should probably look this up, there must be a paper on this. Choosing the right anchor is quite a task, similar to buying a new phone. There’s substrates to consider, weight, space on the boat, laws etc. But an anchor is basically just an object on your boat, which you have your boat tethered to, and just drop where you’d like to park. And there’s the problem. Dropping any heavy, spiky object into the sea, can be very inconvenient for the locals down there. Just as an explanation, we recently found 18 anchor damage points on 100 meters of local reef. 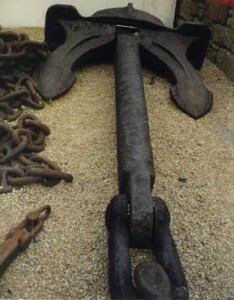 An anchor, in the “right conditions”, can impact up to 6 square meters. In this Location, 100 m of reef equal 250 square meters. 18 damage points equal potentially 108 square meters of damaged reef. That’s 43.2 % of the reef damaged. That kind of implies it only takes 41.6 boats to completely obliterate our reefs. In 5 minutes, that how long it takes to drop and lift an anchor. One: there is still a lot of reef, because we are talking about potential and not the real damage. Two: the local captains are extremely aware of this, and only do so in an emergency. Even the “big, bad companies” drop their anchors in smart places. At least when we’re around. So where do these damages come from? Let me try to explain. Before we installed the cheap charley mooring system, which this article is about, we did what sane people should do, we talked to the captains who are supposed to use it. They wanted them in really weird positions, very shallow, difficult to reach, and in general not very safe to get to. We were surprised to learn this, and the explanation is even more surprising: it’s the customers that want to go there. Apparently, the average snorkeler or day tripper cannot be bothered to swim 5 meters over the reef crest, to get from a save mooring location to the nice little fishies. It’s necessary to park on top of it, or money will not be paid, and the company publicly insulted on Trip Advisor and so on. Pretty outrageous, if you ask me, but you shouldn’t. It’s none of my business. Our business is to come up with a cheap and safe solution, that doesn’t require 6 years of debate. It only takes 41.6 disgruntled tourist to destroy the reef. Cheap Charley is dry for the last time. It’s so simple, it’s ingenious: a piece of rope, inserted in a garden hose, tied around dead, massive coral (we currently have lot’s of it). One buoy on the surface, one underwater, to keep the rope off the healthy inhabitants. With a nifty little knot, which breaks before the coral breaks, should a giant boat be suicidal enough to drive close to the moorings. 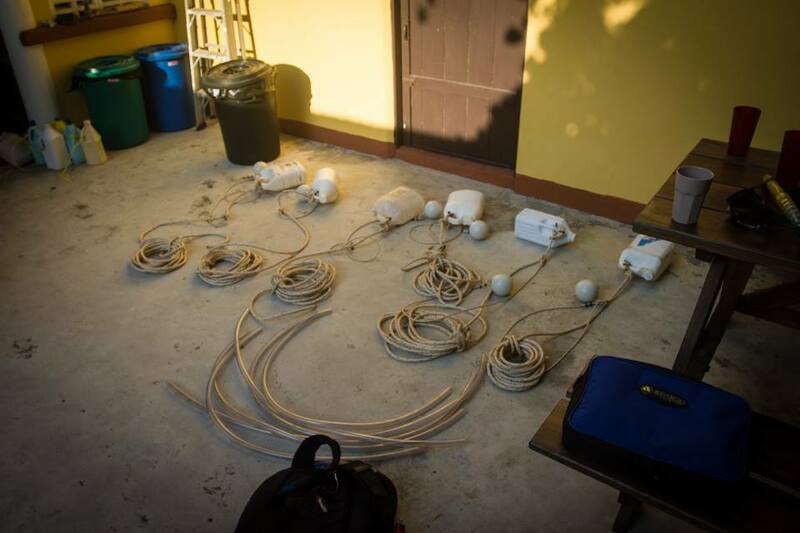 Average cost per mooring: 3 U$ dollars, because we used salvaged materials and some epoxy. Acceptance: instantaneous. We needed guards to stop boats tying up to the divers. We will publish the design, as soon as Stef has the time to bring it to paper (it’s his design), and keep monitoring the effectivity and longevity. It’s a work in progress (as usual). It’ll take a bit of maintenance, but I guess that’s our job. It’ll also take a bit of cash. Maybe you have a spare dollar?